Born in Bendigo, Victoria, Australia in 1978, Matthew started playing at age 7. He is the former principal euphonium player with the Central Band of the Royal Air Force in London, United Kingdom and all Royal Australian Navy Bands. He has held high profile recording and principal/section positions with the world’s leading bands and orchestras including: Black Dyke, Fodens, Leyland, Desford Colliery, Brighouse and Rastrick, Cory, Dalewool (NZ), Woolston (NZ), Victoria Brass, National Band of Australia and the Fountain City Band (USA) – Tasmanian Symphony Orchestra, Auckland Philharmonia, Melbourne Symphony, Sydney Symphony, West Australian Symphony Orchestra, the Malaysian Philharmonic, the Oporto National Orchestra – Portugal, the Iceland Symphony Orchestra and the Louisville Orchestra USA. Matthew completed his PhD studies and graduated as a Doctor of Music from the Sydney Conservatorium of Music and University of Sydney in 2011. He has recorded four commercially available CDs: ‘Neath Austral Skies, ‘Utaki – The Sacred Grove’, ‘HOMELAND’ featuring repertoire commissioned and composed specifically for him, this CD received critical acclaim and was named ‘CD of the Month’ in the Brass Band World Magazine (UK) and was a finalist for ‘Solo CD of the Year’ in the same Magazine. His latest research CD project includes recording and compiling all of the solos by famed Australian composer, conductor and instrumentalist; Percy Code for the first time in history eleased on the Potenza Music label (U.S.A). 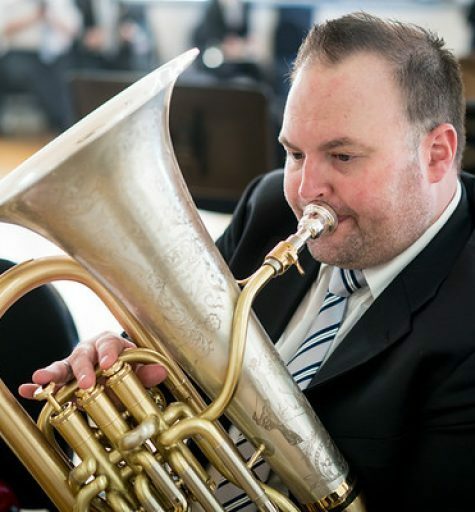 Since 2006, Matthew has been a brass ensemble conductor and euphonium and low brass lecturer at the Melbourne Conservatorium of Music and Sir Zelman Cowen School of Music at Monash University. In August 2016 Matthew took up a one-year temporary position as Assistant Professor of Music – Director of Bands and Low Brass at Cameron University in Lawton, Oklahoma, U.S.A. His duties included conducting the Wind Ensemble, Brass Ensemble, Pep Band and teaching applied low brass lessons. In December 2016 Matthew performed with the world renowned ‘Chicago Symphony Orchestra’ Brass section at the opening concert of the Midwest Conference at Symphony Center, Chicago. Matthew is proud to be an Eastman Musical Instrument Company Brass Artist and Clinician and an endorsee of Reunion Blues gig bags. Matthew uses his own VAN EMMERIK signature mouthpiece range when performing. Matthew is married to his beautiful wife Monique, and they have two son’s William 6 and Patrick 3.